Serving Northeast Ohio for over 18 years! Ridgeview Tours - General Public Tours! Depart Ohio for New York. A delightful lunch stop in route is included in the tour price. Day 1 Take a bite of the Big Apple! 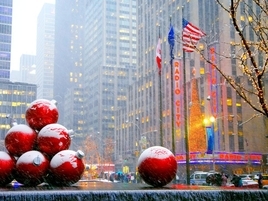 Travel with us to New York City at the height of the Christmas Season. Come see the most spectacular Christmas displays at Rockefeller Center and around the city that never sleeps. Shop and have lots of free time to discover NYC on your own! New York is really at its best during the holiday season. The fantastic displays throughout the city are breathtaking. Of course, the Rockefeller Center Christmas Tree is the star of the show! Arrive in mid-Manhattan early afternoon on Friday. Ridgeview Tour’s Tour Director will be available for assistance on "how-to" questions. Our hotel is a location-friendly hotel in Times Square. Right in the middle of shopping and site seeing! Buy your own half price Broadway show tickets at the TKTS Booth! Dine where you wish! Shop till you drop! You decide! Day 2 Check out of the hotel and get a bag & go breakfast (included in the price). More freedom to do what you would like to do without a set itinerary. Tour the city by foot, subway, or by taxi! Additional packages available to visit the Statue of Liberty and Eilis Island, tour the World Trade Center memorial, and other museums! Before we depart the Big Apple, we will stop at Grand Central Station. Opened to the public on February 2, 1913, Grand Central is a world-famous landmark and transportation hub in Midtown Manhattan. Its rich history is a story of immense wealth and great engineering, but also of survival and rebirth.